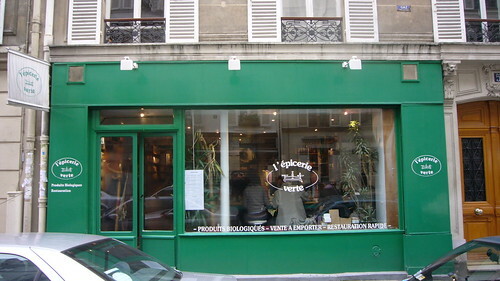 L’Epicerie Verte is a popular, small shop behind the Ternes farmer’s market on rue Saussier Leroy. They sell high quality organic groceries and serve light meals from lunch to early dinner. Cette boutique de produits biologiques devient le midi un snack où vous pourrez commander tartes et salades à des prix tout doux. Une unique table avec des tabourets hauts vous permettra de lier connaissance avec d’autres végétariens. Across the street is Etik, a store that sells global, ethical, bio-diverse gifts and merchandise. You can eat organic, shop organic, and support the independent workshops in one little block. 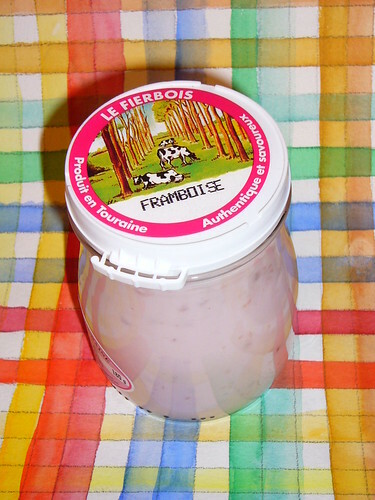 Last week I noticed a small bottle of Lemon Le Fierbois yogurt in the fromagerie stand at my local market. In a fit of whimsy, I added it to my order. It sat in my fridge for a few days and I remembered it while looking for breakfast yesterday. This was an eye opener! I’ve had premium yogurts before. In the US, they are typically creamier and the fruit is not swimming in a sugar sauce. But nothing like this yogurt. It has bite. It has character. It has chunks of lemon peel and fruit. Needless to say, this yogurt is filled with taste. It comes directly from the farms of Touraine, in the Loire Valley. You can purchase this online from FoundIt4Food in the UK. Expect to pay around 1.10 Euros at your local fromagerie in France. I also like the glass bottles with resealable lids. These will be great for water jars while painting in the field.